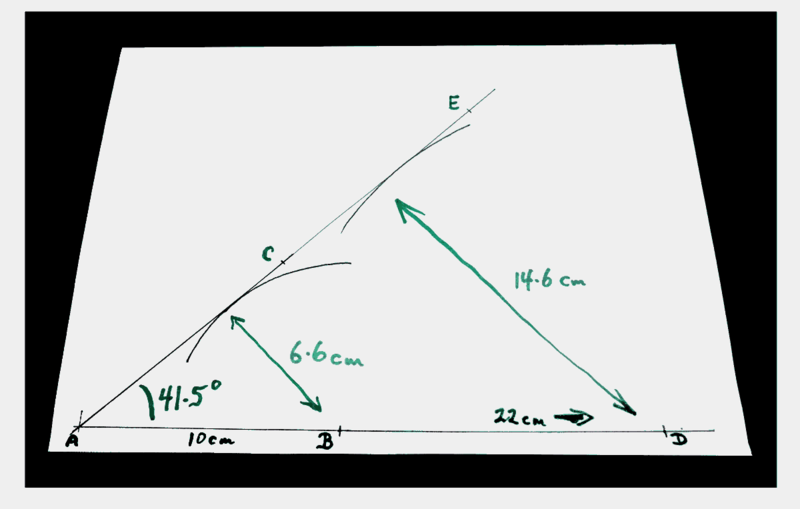 This page will talk about a way to draw an angle of whatever size you need. Protractors are fine... for some things. But not the only way to draw angles. The way you will be shown has many applications, even though it has been put on the web in the midst of pages about how you can make maps yourself. 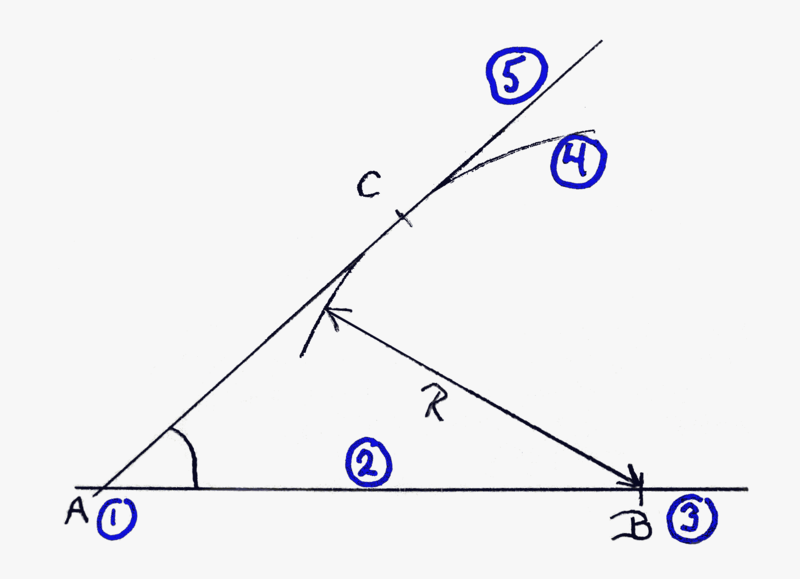 You will start with a point which is where the angle's apex will be, and draw one side of the angle from there. At a distance chosen by you, from the apex, on the side you've drawn, you'll place another point, which we will call B. Next we will set the compass a very particular radius. I'll show you how to know what setting to use for the angle you want. 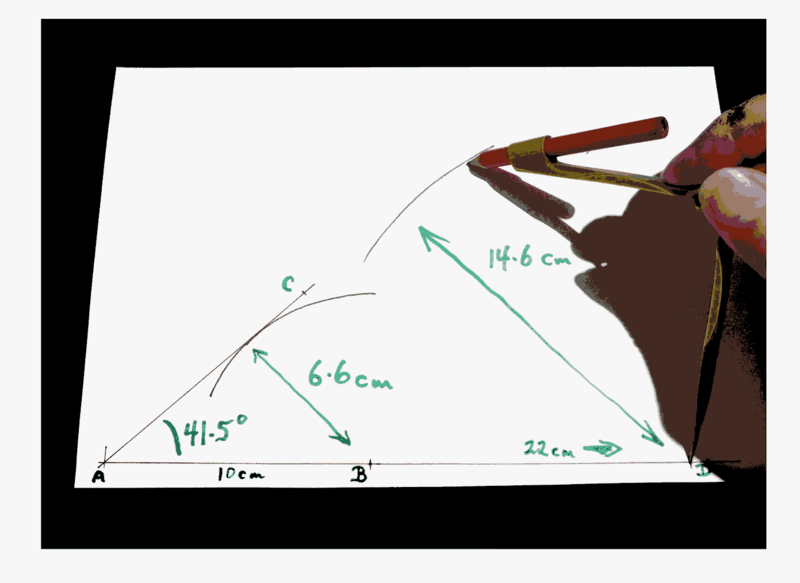 ... and finish the angle by drawing a line from the apex so that it just touches the arc you drew. 1: Establish where apex will be, "A"
4: Draw arc. Center at AB, radius R, with "the right numbers" for the angle you want. 5: Draw line from A to just touch arc. That's it! Details below... and a few extra bits along the way. Just keep reading, for the moment. Bits won't... at first... make sense. But before long, you will come to a heading "What was that all about?". Then you need to go back to reading carefully, making sure you do understand, as you go along. Where the apex of the angle is we will call "point A". Points "B" and "C" are somewhere along the two arms of the angle. The usual way to refer to such an angle is "BAC". If you want to "follow along" (which I strongly suggest), you'll need a piece of paper at least 18cm high and 26cm wide. I hope your lines will be crisper, finer than the lines you see in the illustrations. I made them fat and dark so you could see them. Note that I don't try to stop the lines "where they end". I make the lines a little too long, and use a short line across the long line to mark the location of the point I'm adding to the drawing. 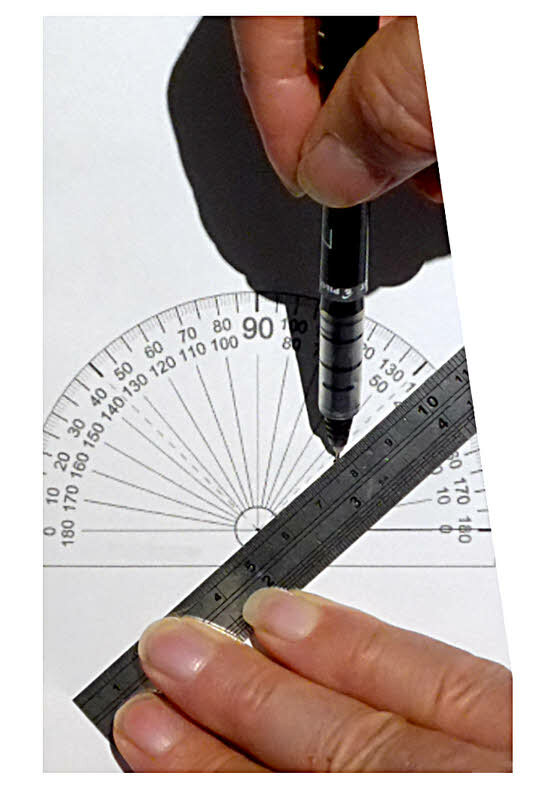 To do this exactly as explained below, you will need a compass which can open at least 10cm, and a good ruler marked in millimeters. Draw a line about 11 cm long, about 1 cm up from the bottom of the page, and starting about 0.5 cm from the left hand edge. Mark point A, on that line, about 1 cm to the right of the left hand edge of the page. Mark point B on the line. Put it 10 cm to the right of point A. Make that "10 cm" as accurate as you can. Good! We've got one side of the angle drawn on the page! Now set the compass to a span of 6.6 cm. Don't, for the moment, worry about where that number came from. Make it as close to 6.6 cm as you can. Draw the line from A that "just touches" ("is tangent to") the arc you just drew. You've done it! 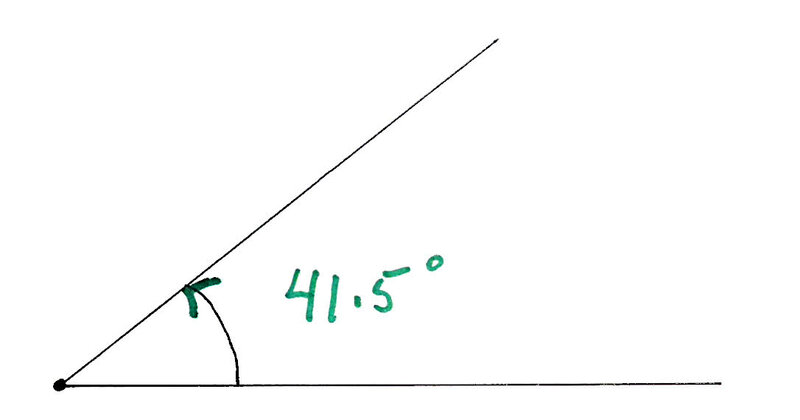 You've drawn a 41.5 degree angle, BAC! And again draw a line which is tangent to the new arc and passes through "A". Mark a point on the new line E.
These numbers also result in a 41.5 degree angle. 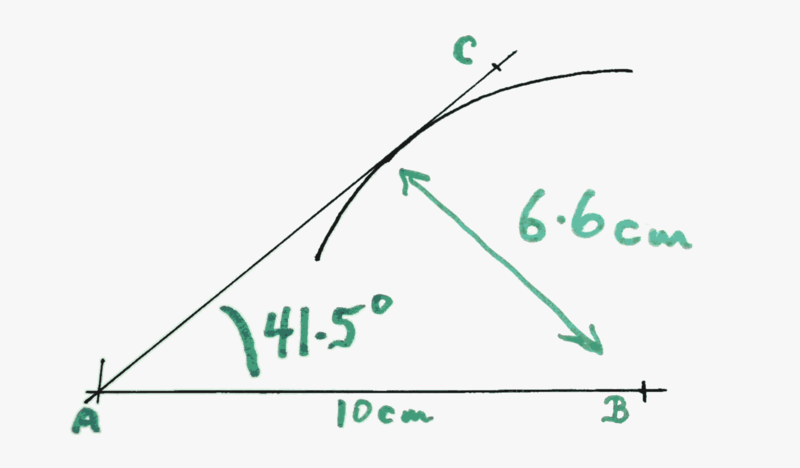 If your BAC isn't quite the same as your DAE, the latter is most likely to closest to 41.5 degrees. Why? Only two things matter: How carefully you measured the two distances. 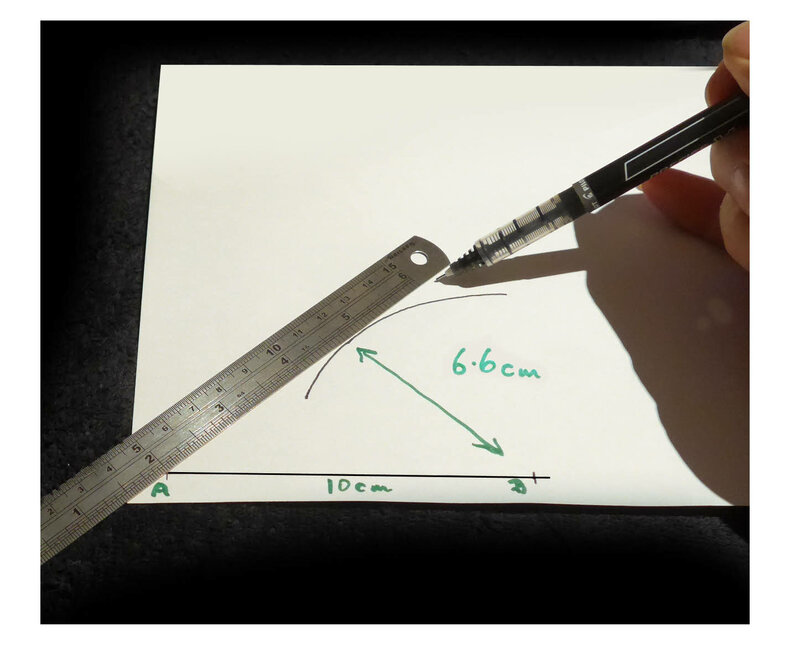 You can probably draw to about 1 mm accuracy. A 1 mm error in a short line, i.e. 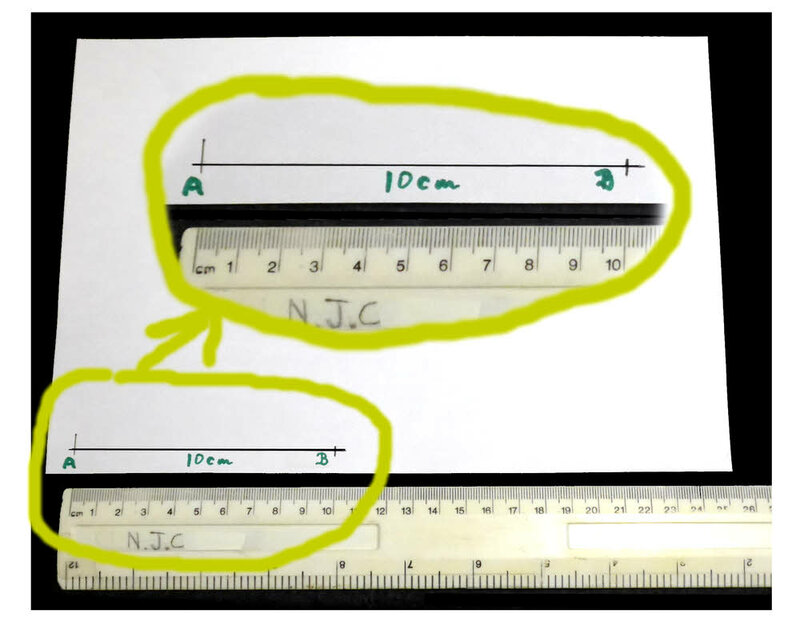 the 10 cm line AB, is a bigger error than a 1 mm error in a longer line, i.e. line AD. The description above is all well and good, if you want to draw a 41.5 degree angle. And your piece of paper is the size stated. But what would "the numbers" be to draw other angles? Here's how we can work out the numbers needed for any angle, any size sheet of paper. 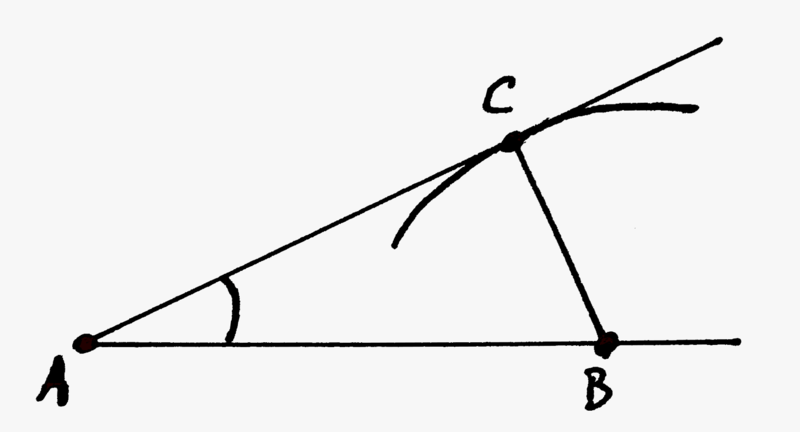 Mathematicians invented "trigonometry" not just to harass schoolchildren, but also to solve such problems. 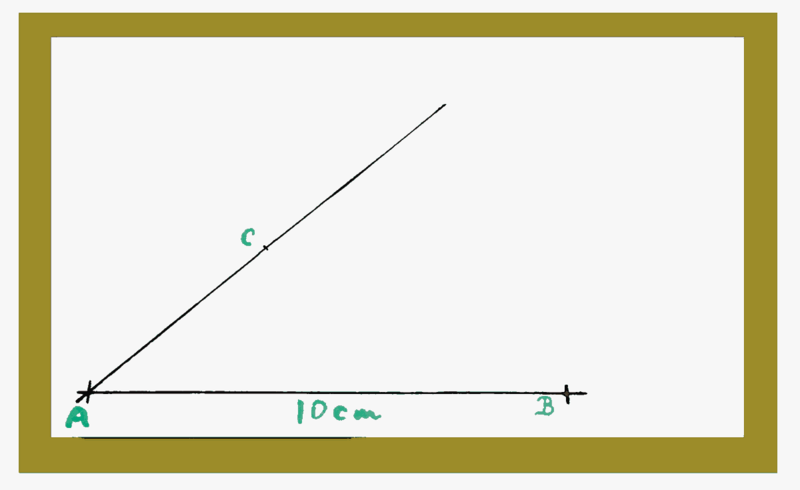 "BAC" is the angle we want to draw. We know how big it is, in degrees. We chose the distance "AB" to suit the size of the piece of paper we had. I'll work another example in a moment. First, what's this "sine" thing? If you are getting different answers... sine(30)=-0.99, for instance... then you may have been looking up the sines of angles measured in radians. Radians are just another way of measuring angles, like inches are an alternative to centimeters. Everything on this page is done in degrees. 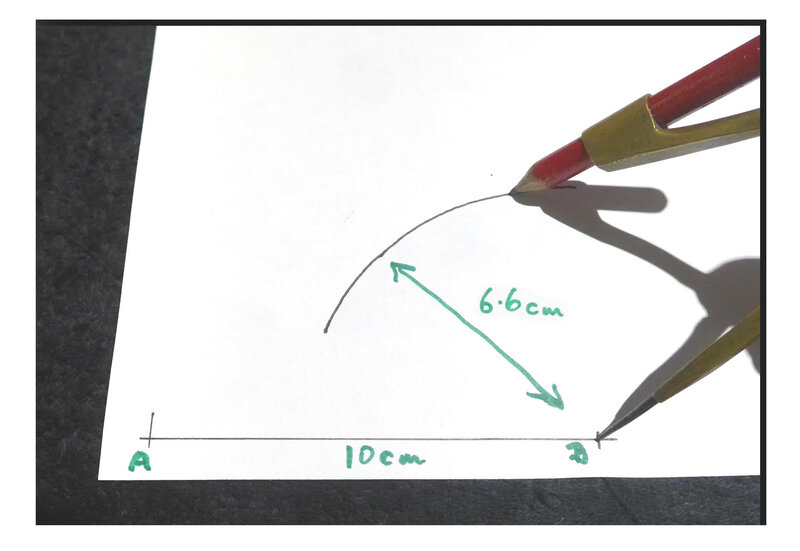 As a second example, let's say you want to draw a 30 degree angle on the same sheet of paper you just used. We'll put the apex at "A" again, and re-use AB as one of the sides. Set the compass to 11 cm, draw the arc, draw the line from A that is tangent to the arc, and you've got your 30 degree angle! It's that easy. This whole discussion arose in the context of drawing maps from your own measurements of angles. Such map making will involve drawing many, many angles. It would be quite simple to set up a spreadsheet with a few "constants" in cells at the top, and then a table below, giving the different arc radii needed for the different angles needed for the drawing of the map. 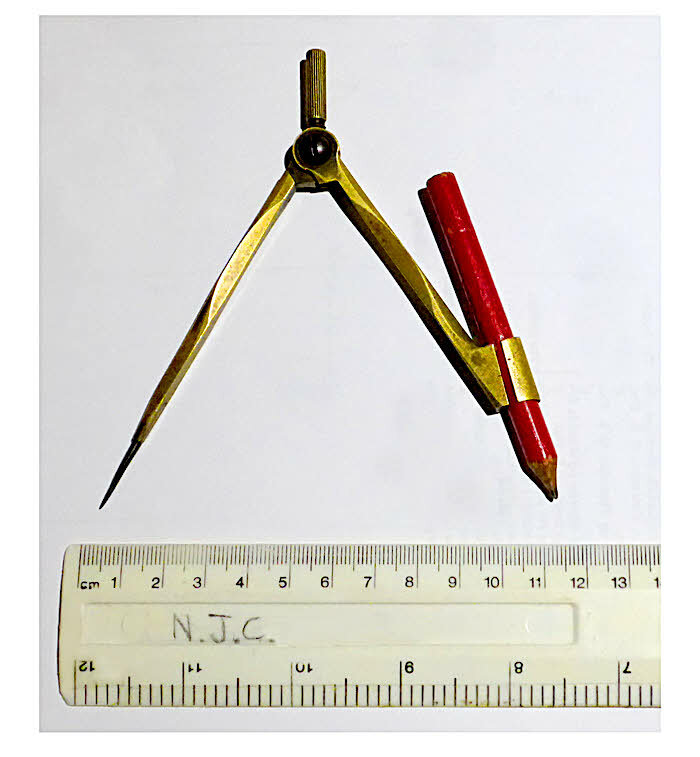 You may find Wikipedia's page on the history of trigonometry interesting. Although people had worked with parallel concepts for centuries, the concept of a "sine", precisely as we use it, is credited to Indian mathematicians, around 500 AD. It was 1100 years later that a table of sines first appeared in a book printed in England. That was Thomas Fale's 'Horologiographia, the art of Dialling', London, 1593. So.. back to making your map! I hope that's why you came here? You were in the midst of trying to make your own map, by triangulation? And needed a way to draw angles accurately? Give it a try, on some level, if you weren't... it can be a lot of fun.